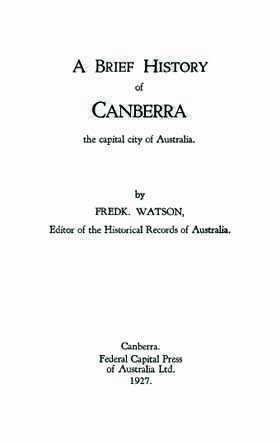 A brief history of Canberra the capital city of Australia by Frederick Watson, (1927) outlines the early history of the region in some detail from European discovery by Charles Throsby in 1820, settlement by Moore and others from 1826, the determination of the site for a federal capital to the early development of the city. Apart from the trials and tribulations of the first European settlers the dialogue covers the establishment and early years of the Church of St John the Baptist, and the exploits of Frank Gardiner and his fellow bushrangers. The Oliver Inquiry into the selection of a site for the Australian Capital Territory and the subsequent debate occupies a significant section of the book as does the initial planning by Griffin and the initial construction period from 1921 to 1927. The establishment of Duntroon in 1910 and its early years are also featured. The publication names early settlers in the area and some have significant biographical information written about them including Throsby, Moore, Campbell, Ainslie, and Farrer. Other men mentioned who have lesser biographical details included but are still well worth accessing include, Murray, MacPherson, Klensenddorlffe, Palmer, and Hayley.